Well, according to the badge it”s really a Sigma. But cars, all looking identical at first glimpse, were offered around the world as Mitsubishi Sigma/Diamante/Verada/Magna. This particular range was on the menu between 1990 and 1996. Cheap the Sigma was not, but it was good value for the money. Mitsubishi was not as prestigious as a Mercedes, a BMW, an Audi or a Jaguar, but the build quality, the size and comfort level made it an interesting choice for everyone looking for an executive car and not a shiny badge. The fate of these cars was determined by their lack of prestige. The value of the Sigmas was dropping very fast, making the used ones affordable for people with thinner wallets but still looking for luxury. Unfortunately these people couldn't spend as much money on maintenance and getting the minor but costly repairs done, which along with the low market value of the cars was something of a death sentence. A leak in any airbags of the four struts fitted with conventional and air springs could make the small compressor work almost non-stop, causing early wear. A replacement compressor, new air spring struts could cost more than the used car itself. No wonder that the Sigmas fitted with ECS (Electronically Controlled Suspension, first introduced in the 1987 Mitsubishi Galant, the very first production car with semi-active electronically controlled suspension system) are so rare nowadays. 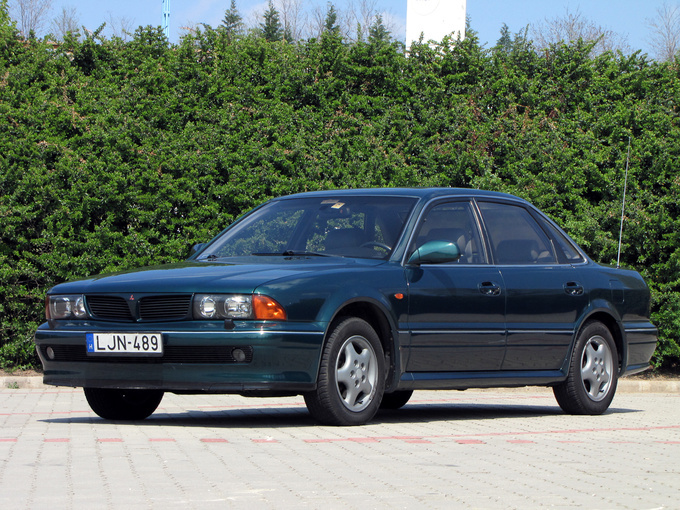 Should you find a decent 24V with working air suspension (easier said than done), you will get a nice everyday drive. It is not very economic though: fuel consumption of an automatic is somewhere between 9-14 litres/100 km (the original owner's manual gives almost the same values, quite unusual compared to today's technical sheets). This specific Sigma has an aftermarket electronically controlled LPG system, making the car more economic and ecologic to drive. In heavy city traffic the LPG consumption is around 15-16 litres/100 km which amounts to approximately 10 litres of petrol. The car runs very smooth, the auto gearbox does its work almost unnoticeably, downshifting can only be felt when braking hard. On bad roads the ride gets rough, as the ECS makes the dampers' setting hard on bumpy surface. The same thing happens when cornering sharp or braking hard, but it is not only the dampers that stiffen up, also the air springs of the outer wheels will be inflated within fractions of a second, thus minimizing body roll and optimizing handling. Above 50 kph the hydraulic rear wheel steering will be activated to make maneuvering even more precise. When hitting highway speed, the car lowers its nose to stabilize itself. Should you turn your lights on, the rear end gets lowered, too. When sitting in the leather seat, adjusted to your previously saved settings with the press of a button and riding in the car on normal roads you feel like taking a magical carpet ride. The V6 engine makes a Mitsubishi-typical sound (a bit like an electric drill), pulling well from lower revs, and willing to go over 6000 rpm. Once in Germany or on a racing circuit, you can drive at 225 kph, but setting the cruise control to 130 kph saves you fuel and speeding tickets. And you should bear in mind that the brakes are OK for 1992 standards, but they readily start to fade when hitting them hard several times. On slippery surfaces the traction control with TRACE function helps to keep the car on the road. Factory fog driving lights, headlight washer and adjustable headlight height are there to make driving safer at night. The windscreen wiper's intervals automatically adjust to driving speed. Naturally all these features work way more roughly than the similar systems of today's vehicles, but it is still nice to have them in a 20 year-old car. The Sigma is 4750 mm long with a wheelbase of 2720 mm, but it actually does not feel as spacious as, let's say, a Skoda Octavia that is about 90 mm shorter. The boot with 447 litres isn't too big, either – although we must admit, the LPG tank placed in the spare-wheel well is higher than the original wheel, thus stealing some cargo space. 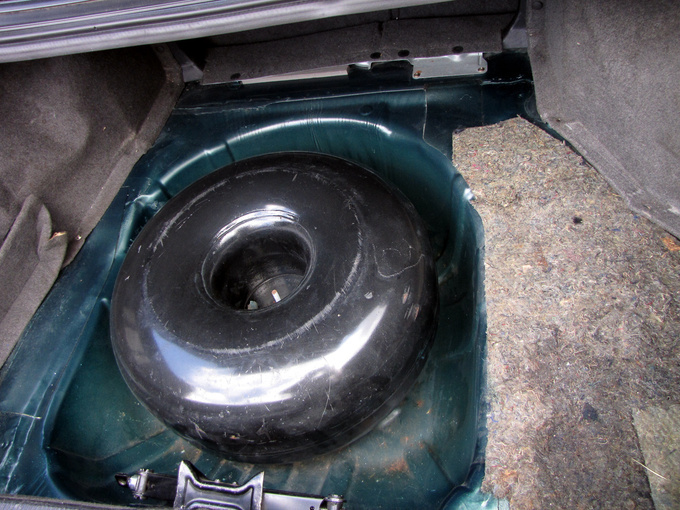 If you are brave enough not to place an emergency wheel in the boot (living in areas with potholes as big as a man's head it might be risky not to have a spare with you), the boot is still big enough. 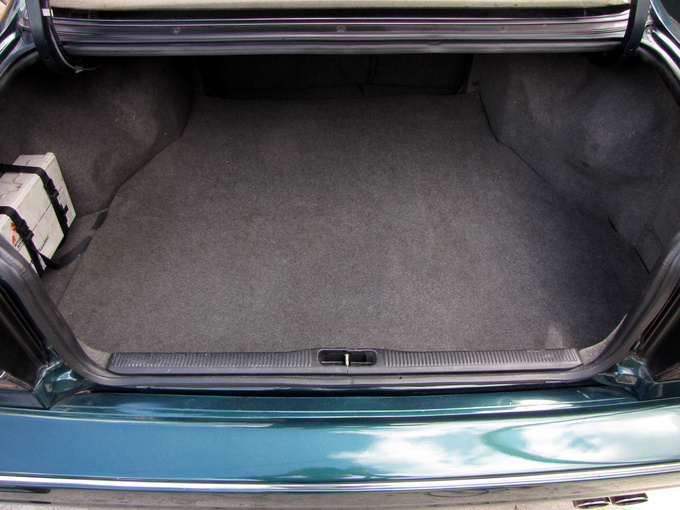 The rear seats can be folded, so you can carry longer items in the car as well. 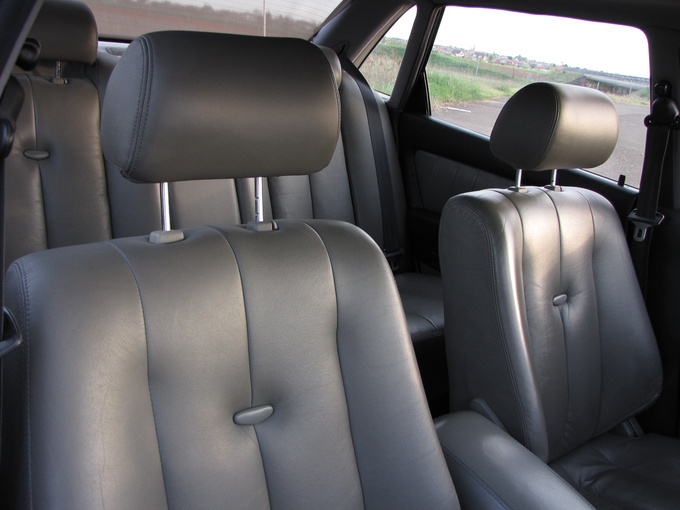 As to the passenger compartment: the car is quite comfortable, both seats are electric, the driver has lumbar support too. Unfortunately the leather used by the Japanese manufacturers in the 90's needs a lot of care, and still they tend to become hard and crack. But the wooden trim will never crack and bristle, as it is made of plastic. All panels are decorated with printed wood grain and shiny clear-cote on top. 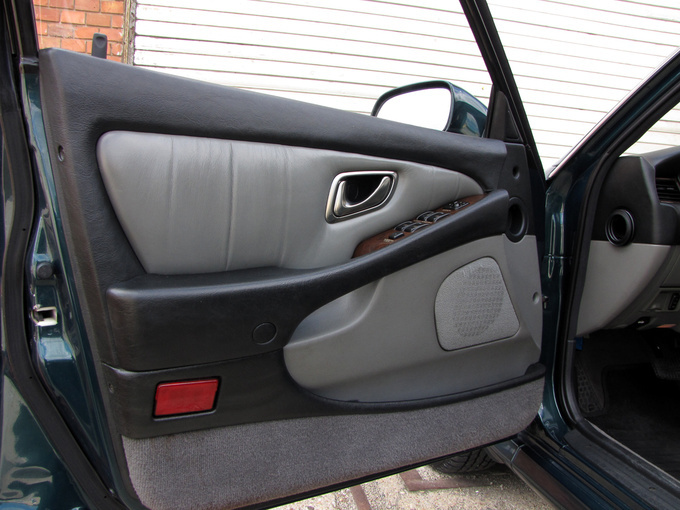 It isn't everyone's cup of tea, but plastic wood trim is so very 90's: it is a little piece of history. The climate control panel is like a handheld Nintendo video game of the era: colourful icons in the dashboard show the way the air goes to the vents, they are even animated when settings are being changed. When you command cool air towards the windscreen, blue arrows start to move, when warm air is needed in the legroom, moving red arrows appear on the tiny screen. 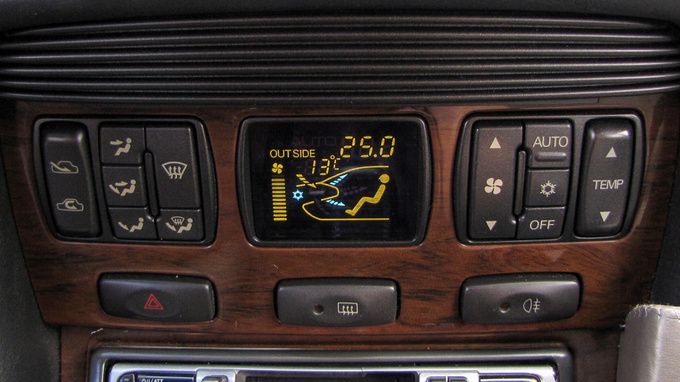 A solar-sensor on the dash, a temperature-sensor on the roof, and a humidity-sensor under the rear window allow for totally automatic climate control. The styling of the body is very typical of Mitsubishi, actually all Mitsubishis of the era had similar front and rear ends. The shape of the car is of a classic, three-box sedan, but the slanted nose, the definite shape of the wheelarches and the spoilers make it look sporty (especially with larger aftermarket wheels). The most significant design elements of the car are the door handles, no wonder onwe of them is featured on the cover of the owner's manual. The first generation Sigmas are easy to identify by the chrome grill, second generation cars had a smaller, painted one and smaller fog lights too. There was almost no change in the back, except for the Sigma badge having been moved a few centimetres towards the centre. Sigmas, Galant Sigmas, Magnas and Veradas existed before and after 1990 and 1996, but the generation we are about to discuss is the one that is really interesting, because this was the only one to be offered not only in Australia, New Zealand, the United States and Japan, but in Europe, as well. The other generations had not been available on the old continent. 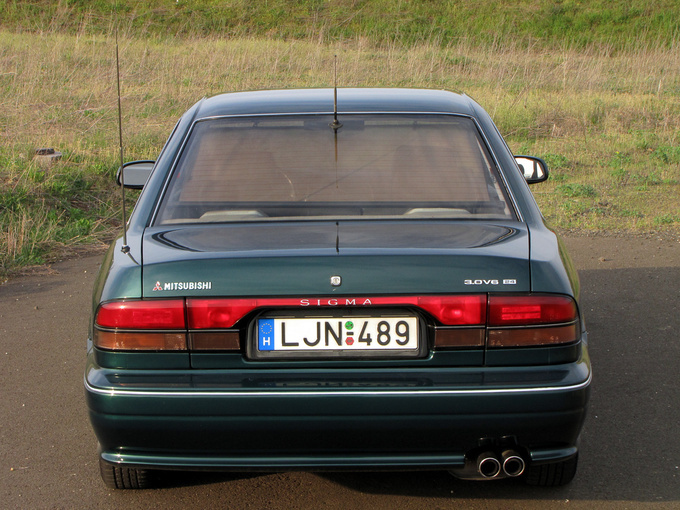 The Diamante was introduced in 1989 at the Tokyo Motor Show, together with its sporty relative, the Mitsubishi 3000 GT. 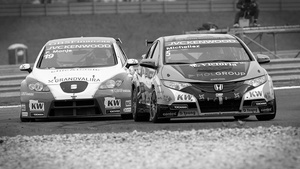 The two models shared the same platform and both had been available with four wheel drive. During its lifetime the Diamante was sold with 2.0-, 2.5- and 3.0-litre V6 engines, ranging from 122 to 173 PS. 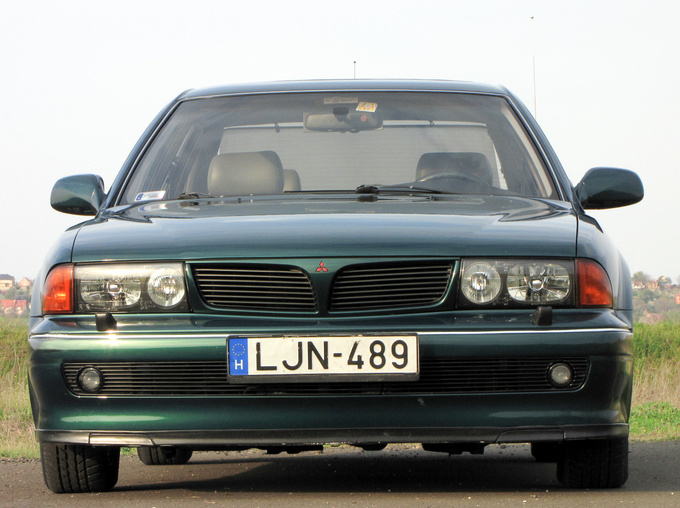 The top of the range engine was the 3.0 DOHC 24V with 205 PS. The three litre SOHC and DOHC engines were also available in the 3000 GT, but unfortunately its twin turbo, 300 PS version never made it into the Diamante-family. Diamantes arrived to the showrooms of the Japanese market in 1990. It was the first generation of all Diamantes and became Car of the Year in the land of Pachinko machines and manga books. Back in the early ‘90s it took more than attractive styling and a powerful V6 to win such an award in Japan. The bubble-economy was growing at the speed of the Shinkansen-train at full power, all manufacturers were introducing new models and new technologies. Everything was miniaturized, computerized, motorized, turbocharged. Major brands were about to conquer the world with their new luxury brands: Honda had Acura, Toyota had Lexus, Nissan had Infinity, Mazda had Eunos. And Mitsubishi had – well, Mitsubishi. Somehow they did not feel the need to release their top-of-the-range cars using a separate brand, but they still wanted to make money in the premium range. The new car arrived in Australia the following year to become the second generation of Magna, manufactured by Mitsubishi Motors Australia. But the Magna was just the bread and butter Diamante/Sigma, equipped with a 2.6-litre inline four (131/137 PS) - the base models even had carburettors and manual window winders! The luxury version with a V6 was called Verada. In 1992 they started selling the Diamante in the US too, and, who knows why, the Sigma was released in Europe. The Sigma was not a Diamante, just a close relative, more like a Verada: the Diamante had four side windows and no door/window frames, the Sigma had six side windows, conventional doors with window frames. This may not seem such a big difference, but in fact the whole body was different. Pillars, doors, wings, windows, bumpers - nothing was the same, and this is just what you could spot from the outside. Several components in the passenger room were different too. In fact there were so many differences between Diamantes, Sigmas, Veradas and Magnas, that it is almost impossible to list them all. And we all know this is not really the key to cost-effective production. This and the fact that in Europe the Sigma was only available with the biggest engines and almost all options were probably the reasons why it was never sold in big numbers. A version with the inline four engine and lower spec option packages could have made the Sigma (especially the wagon, released in 1993) a popular travelling car in Europe. But no wonder the Mitsubishi executives made such decisions when the most popular Japanese song of 1990 was Odoru Pompokolin by B.B. Queens. 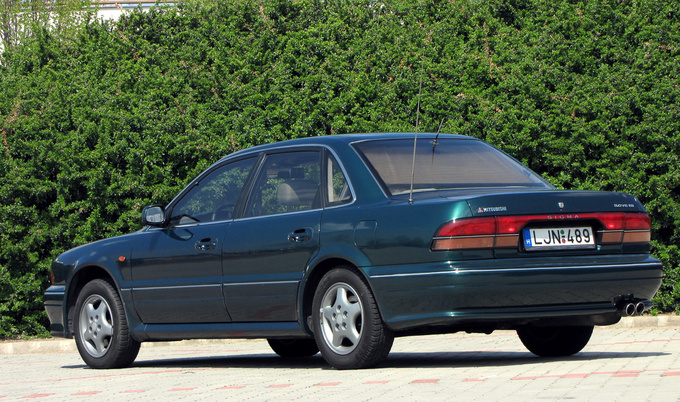 The top-of-the range Sigma in Europe was the 3.0 24V V6 sedan. One could say they were fully equipped as there had been only a few options you could tick when ordering yours at your friendly Mitsubishi Dealer. Just pick full leather interior, airbags, heated seats, and you had everything on board. The 24 valve cars with electronically controlled automatic gearbox had traction control, cruise control, electronically controlled suspension with air springs and electrically adjustable shock absorbers (controlling body roll, body height, suspension stiffness, self levelling), four-wheel steering, climate control, four power windows, electric sunroof, heated electric mirrors, central locking, power seats with memory function for the driver, headlamp washer, just to name a few gadgets. This was quite an impressive list in 1992, even for a car in the premium segment. 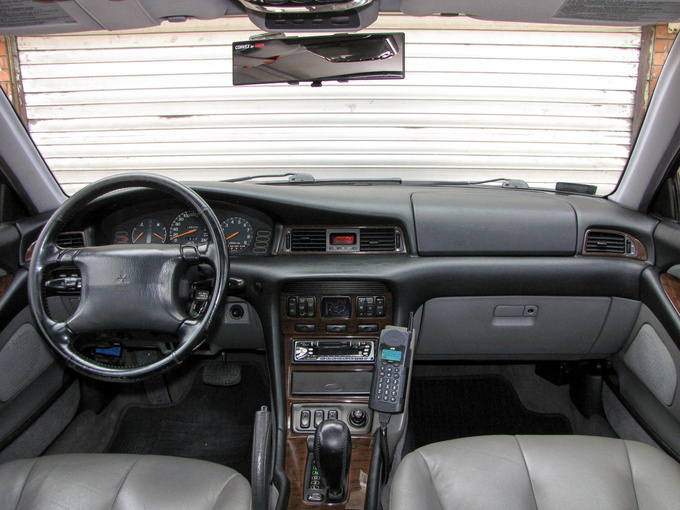 When comparing the interiors the biggest difference can be found at the dashboard. Early Sigmas had been only available with a driver airbag, while facelifted versions could have a passenger 'bag too. To fit the second SRS-balloon, the dashboard had to be reshaped, looking a bit clumsy in the end compared to the early version. Even the steering wheel was restyled, but basically that's it, the facelift was not a big issue. Having a Sigma for a daily driver is a nice thing, but there are a few things that make an owner's life hard. No doubt that you will have a malfunctioning ECS sooner or later, the question is when it's going to break down. The rubber airbags of the air suspension will crack with age, some of the solenoids of the system might also get jammed. A few years ago it was possible to fit new airbags (the shocks showed no sign of wear as they were totally sealed off from dust and moisture), but the raw material is not available anymore. New struts may cost as much as $600 each. Not many will spend so much money on a car worth a few thousand. Rust is not a real issue, spare parts for basic maintenance are available at a reasonable price, but keeping the over-sophisticated systems alive may cause a lot of problems. Sigmas have never dominated the streets of Europe, and they won't ever be collectors' items, so the next time you spot one, take a good look. It might be your last chance.